Thomas “Butchie” Treska of Somerville, formerly of Boston’s West End, passed away, October 17th, after a lengthy illness at the age of seventy- three. Beloved husband of Jackie (Nyreen) Treska. Loving father of Carolyn “Cal” Treska of CA. Devoted son of the late Peter and Margarita “Rita” (Kocu) Treska. Dear brother of Mary Ann Treska of Somerville and the late Dorothy Steriti of Worcester and Virginia Treska of Somerville. Cherished uncle of David Treska, his wife Patricia of Dracut, Marji Biagioli, her husband the late Peter, of Somerville, and Stephen Steriti, his wife Wendy of Dudley, as well as his great-nieces and nephews, Brooke and David Treska and Evan and Ethan Steriti. Also survived by many dear friends, including the Sacco and Denaro Families of Woburn. A Funeral Service will be held in the Lynch-Cantillon Funeral Home, 263 Main Street, Woburn on Saturday, October 27th at Noon. Relatives and friends are respectfully invited to Calling Hours from 11-Noon prior to the Funeral Service. In lieu of flowers, donations may be made in Tom’s name to the Parkinson’s Foundation, 200 SE 1st Street, Suite 800, Miami, FL 33131. For directions or to leave an online condolence, please visit www.lynch-cantillon.com or find us on Facebook under Lynch-Cantillon Funeral Home. 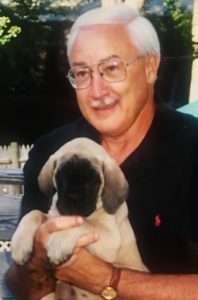 Thomas R. “Butchie” Treska, of Somerville, formerly of Boston’s West End, passed away, October 17th, after a lengthy illness at the age of seventy- three. Beloved husband of Jackie (Nyreen) Treska. Born in Boston to Albanian immigrants, Tom was a son of the late Peter and Margarita “Rita” (Kocu) Treska. He was raised in Boston’s West End and Somerville, and a graduate of Somerville High School. For many years, Tom owned and operated a T-Shirt Cart right outside of the Boston Aquarium. He enjoyed meeting and helping people and loved being out in the City of Boston. Tom was an accomplished professional Bowler and enjoyed Bowling at Holiday Lanes in Medford. He was also an avid sports fan and really enjoyed watching any and all sporting events on TV. He frequented the Wonderland Dog Track and just really enjoyed spending time with his family. Along with his wife Jackie, Tom is survived and will be deeply missed by his daughter, Carolyn “Cal” Treska of CA. Dear brother of Mary Ann Treska of Somerville and the late Dorothy Steriti of Worcester and Virginia Treska of Somerville. Cherished uncle of David Treska, his wife Patricia of Dracut, Marji Biagioli, her husband the late Peter of Someville, and Stephen Steriti, his wife Wendy of Dudley, as well as his great-nieces and nephews, Brooke and David Treska and Evan and Ethan Steriti. Also survived by many dear friends, including the Sacco and Denaro Families of Woburn. A Funeral Service will be held in the Lynch-Cantillon Funeral Home, 263 Main Street, Woburn on Saturday, October 27th at Noon. Relatives and friends are respectfully invited to Calling Hours from 11- Noon prior to the Funeral Service. In lieu of flowers, donations may be made in Tom’s name to the Parkinson’s Foundation 200 SE 1st Street, Suite 800, Miami, FL 33131. For directions or to leave an online condolence, please visit www.lynch-cantillon.com or find us on Facebook under Lynch-Cantillon Funeral Home. A Funeral Service will be held in the Lynch-Cantillon Funeral Home, 263 Main Street, Woburn on Saturday, October 27th at Noon. Relatives and friends are respectfully invited to Calling Hours from 11-Noon prior to the Funeral Service. In lieu of flowers, donations may be made in Tom’s name to the Parkinson’s Foundation, 200 SE 1st Street, Suite 800, Miami, FL 33131. For directions or to leave an online condolence, please visit www.lynch-cantillon.com or find us on Facebook under Lynch-Cantillon Funeral Home. You will be greatly missed Butchie! I love you! Please say hi to my dad, your uncle, when you’ll meet him!